Hoodies are a modern comfort style staple, and JCPenney has a great selection of hoodies for men. Keep warm and comfortable with a casual, sporty look as you go about your day. JCPenney carries the major sportswear brands as well as other relaxed casual brands. Many styles are also available in big and tall sizes so you can be sure to find a hoodie that suits you. Perform at your best in sports hoodies for men. 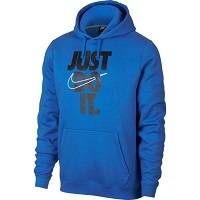 JCPenney carries major sportswear branded hoodies including Nike and Adidas. Find hoodies in high-tech fabrics meant for sports training made with keeping cool and active in mind. Activewear hoodies are sleek and well-suited for professional, recreational, amateur, and armchair athletes, so go for that run while looking cool in a pattern of your choice, or cheer on your team from the comfort of your home. Find a zippered hoodie to use as a jacket while you handle the elements with ease. Hoodies are soft and comfortable, and look great even if you're not wearing them for sports. The major sportswear companies have performance wear and comfort wear as do the other brands such as St. John's Bay, Arizona, and Vans. They are the perfect casual wear for any season and are also available in big and tall sizes. JCPenney's diverse selection of hoodies offers excellent quality and value. Stock up on several hoodies for men in the men's department, and find one that suits your style. Look for hoodies with printed or embroidered sportswear brand logos, as well as ones with front or side pockets. Shop the JCPenney collection of stylish men's hoodies. Hoodies are great for sports and leisure, as well as lounging around the house, but some of them are just stylish enough to wear to work. Depending on your work culture, some hoodies might be appropriate for everyday wear or at the very least for casual Friday. A trim fit and detailed styling make for a smart-looking hoodie that can serve many style needs. Look for hoodies with a full zip for versatility, or wear a warm and cozy pullover style with a roomy front pocket. Hoodies from JCPenney come in a range of bold or muted solid colors, so find one that will make you blend in or stand out from the crowd. You'll be comfortable and stylish all day long. Lounge around the house in one of our comfortable men's sweatshirts. Slip into one of JCPenney's comfortable sweatshirts to keep the relaxed comfort of a hoodie without the extra weight of a hood. 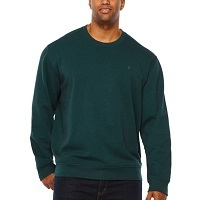 JCPenney's sweatshirts for men are cool, classic, and casual, and provide the perfect layering item for fall. They are also easy to slip on under a jacket for colder weather. Shop men's sweatshirts with cool designs or in fun solid colors, including two-tone designs. Sweatshirts and hoodies for men are the ultimate in comfortable casual wear and JCPenney has one that will suit you.